Many of the whiskeys we see coming out of the craft distillery movement are young or lightly aged whiskeys. The batting average for this category hasn’t been great and it prompted us to write the piece, “Putting White Dog Down“. Aged whiskey gets as much as 60%-80% of its flavor (and complexity) from the barrel it’s aged in, so it’s always nice to sample a whiskey that has spent some real time in a barrel. 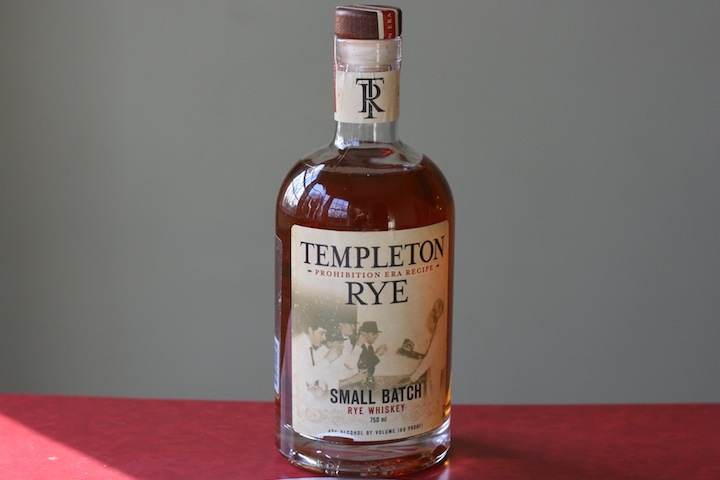 In the case of Templeton Rye Whiskey, the aging process is a full five years. Based on an old prohibition era recipe, Templeton Rye Whiskey is the kind of whiskey you’d find made out of an old farmhouse still. These whiskeys were made to preserve a portion of the year’s crop and the best of it was shared with family and friends. These whiskeys rarely found their way outside of the town they were made in, let alone the state. Templeton Rye has resurrected this old style of whiskey and hopes to bring it to a national market (albeit in small quantities). Templeton Rye Whiskey (80 proof – $50) – Deep yellow-orange in color, it’s clear that the Templeton Rye has seen some good age. The nose leads with the fresh rye spice (which reminded us a bit of the Hirsch 6 Year Rye Whiskey), along with distinct wood notes, which smell like a mix of cedar, pencil shavings and cardboard. There are some very light caramel notes in the nose along with light brown sugar and the slightest hint of wax. It’s one of the nicer noses on a rye we’ve smelled. The entry is a blast of flavor that combines a really nice balance of rye spice and deep wood notes. The spirit feels lush on the palate but manages to maintain the slightest element of delicacy. The mid palate takes the woodsy spice of the entry and builds on it with some nice caramel notes. The finish is long and delightful, holding on to many of the flavors there from the first sip with just the slightest bit of heat.